Is Giant's Barbecue The Tastiest Of All? I recently went to a high school reunion, nothing in itself, but occasion again to be yanked from real life into a movie seen numerous times that left a big impression, just because some aspect of the event took me there. In this case, it was a barbecue grill with a crowd stood round that spoke Giant to me. Did these 150 revelers not get such an obvious connection? Somehow I expected them to, but how reasonable is that? Giant came out over sixty years ago, after all. Less and less people have heard of it since. All the world's a screen, however, at least for film hounds with much of lives given to it. 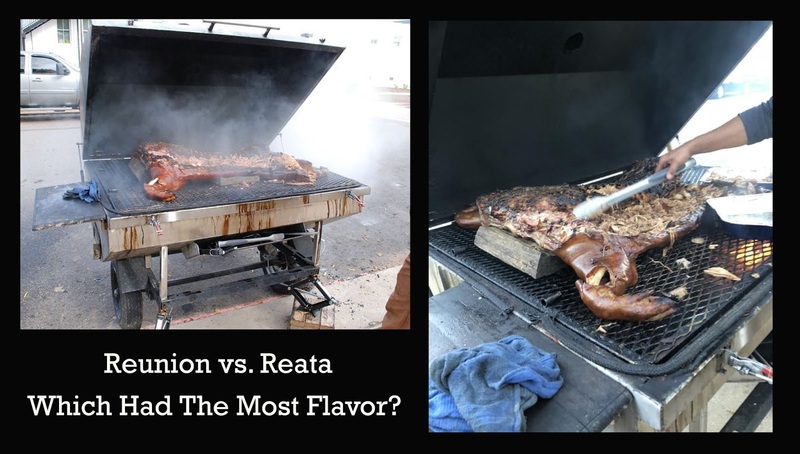 The reunionists grilled a pig for their open air feast, as in a hog split open and brimming with fresh meat, to which came the revelation that I am Bick Benedict and these are my guests. Survey of classmates did not reveal a Jett Rink stood apart and pulling a horse's tail, nor a Leslie/Liz, however well-preserved some of attendees were. Barbecue transported me to Reata, Giant my pick (or pig-pickin') for a most vivid cook-out in all of movies. It seems not fashionable these days to like Giant, but to this mind and eyes, it is every bit the "Cavalcade" Warner's promised in 1956 publicity, barbecuing but one of plenty highlights spread over three hours and twenty-one minutes. Can't, in fact, think of a 50's epic I like better. The barbecue scene is early introduction to Reata way of life. It brings on characters that will populate Giant, and firms up those we know. There is flavor and detail few films achieved to then, or since. 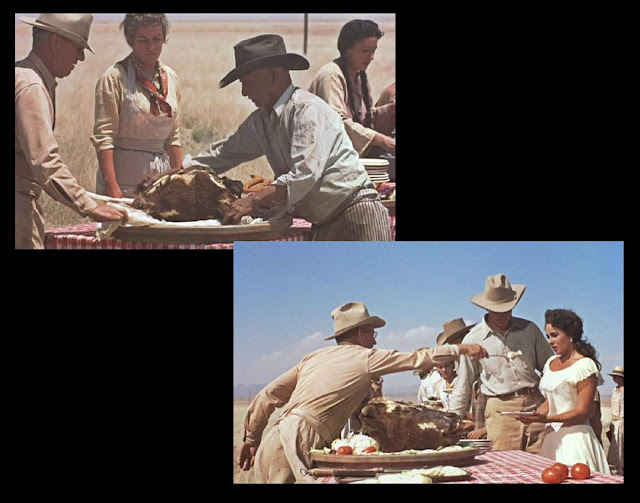 George Stevens famously shot miles of footage he would spend a year sifting through. His camera addressed players from every angle, requiring take after take, which had to exhaust them. With so much footage for Stevens to pick from, he got flawless results that were almost intimidating. The barbecue is a Swiss watch of a Giant set-piece, but no more so than the rest of it. Reata neighbors to figure into a next three hours line up one by one to meet Bick’s new wife. We get that this is undiscovered country for her, the barbecue pit stood in for earthy way of life she must adjust to. Also an outlier is Jett Rink, but more so the actor who plays him, James Dean. Separated from the cook-out, Dean lingered apart as well from others of the cast who had to adjust to him. Pulling a horse’s tail as he crosses the frame, Jimmy poses for imagery he knows will be iconic, though to what degree he could not have imagined. Dean understood what it took to register as a star, that more his goal, I suspect, than excelling as an actor. Jett peering from under the brim of a hat, propped full-length in the back seat of a 20’s auto, any of shots devoted to Dean could serve as magazine covers, or giveaway to fans. Stevens had to recognize this as he spent a post-Dean-death year editing Giant. 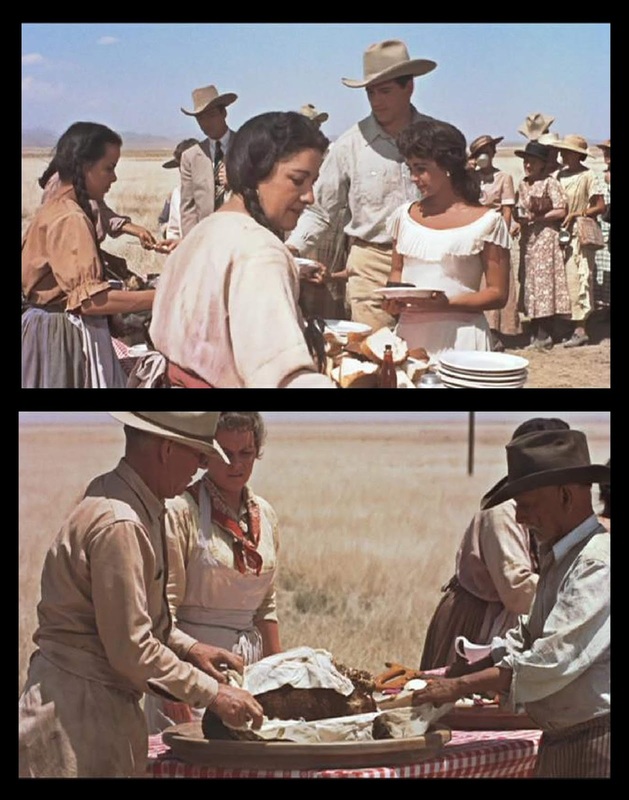 Marfa residents were welcome to the barbecue. By some accounts, they were even fed. Come one and all was Stevens policy for all-outdoor settings. He called townsfolk “good will ambassadors” for Giant. They'd serve as extras for the feed, and many more of them stood back of cameras. Giant stars took breaks to sign autographs. A vista shot includes the Reata house in a far background, space so vast as to make human participants seem fewer. 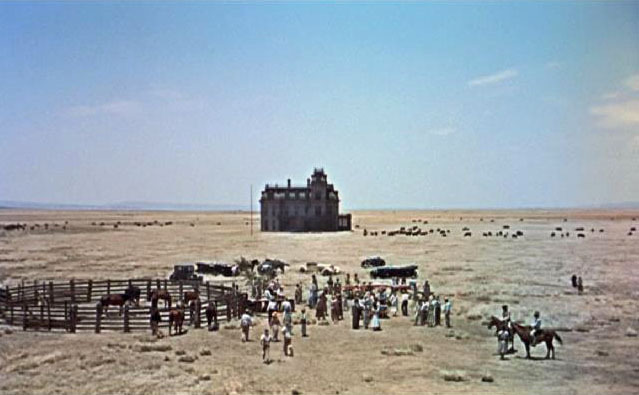 I don’t wonder that pilgrims still go to Marfa and what’s left of the structure, crumbled to almost nothing as it is. Must be spooky to stand alone, or with a companion, and regard what was once such active ground. Hallowed ground, they'd call it. Is it still sacred for Texans after sixty years? The barbecue puts several stories underway as folks feast, Leslie as awkward fit to Texas culture, Vashti announcing her own marriage now that Bick is unattainable, Jett as outsider and photographed so, plus Luz (Mercedes McCambridge) kidded by a tactless neighbor who says Luz would “rather herd cattle than make love.” Jett as friend and ultimate beneficiary of Luz’s estate makes sense for their shared isolation here. For that matter, Bick might be sole among principals not isolated amidst vast space director Stevens uses. James Dean does his soon-to-be-immortal car pose to burnish the point. The auto-mo-bile, as Bick calls it, is reminder that a first half of Giant is period set. Otherwise, and based on Dean's dress and deportment, you could place Jett Rink for here-and-now, as in 1956, if not today. He had done a same trick in East Of Eden with sweaters any 50's teen would be pleased to wear at school, Dean realizing that fashion on him was timeless (would current youth opt for a red windbreaker like what he wore, and made sensation of, in Rebel Without A Cause?). 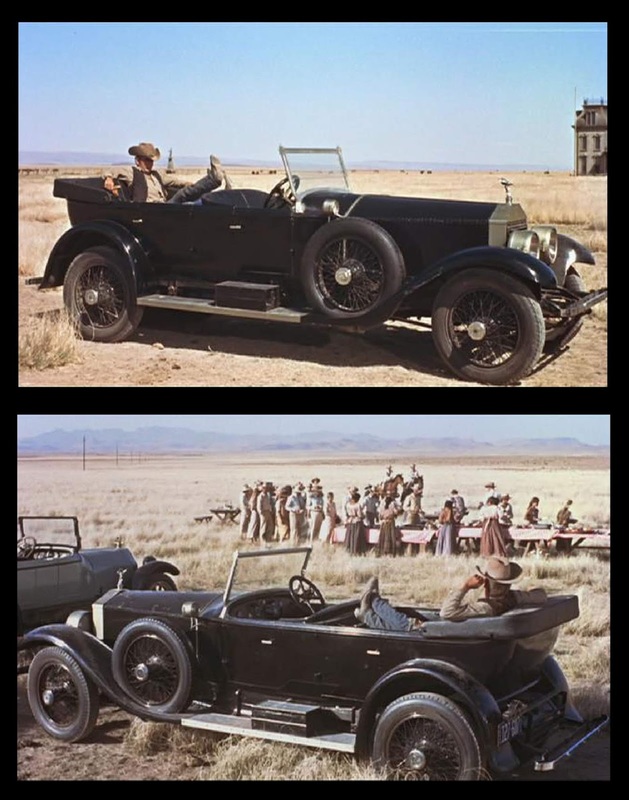 Dean in the car became a most sought after card from Giant's lobby set of eight, and made up all of art on the film's R-80's one-sheet from Kino (at right), this after he became a best reason to go and see a movie old as Giant. We may assume that Jett/Jimmy partakes not of barbecue delights. Was Dean ever shown eating in a film, or would this have brought him too far down to earth? Cary Grant once advised a fellow player never to indulge during a public appearance, because sure enough camera-bugs would capture you with mouth agape and shoveling food into it. Grant knew his public would simply not allow a star to be too human. Big sloppy plates of barbecue are yet repugnant to many. Raw animal on a spit can have such effect. Tough to look at, let alone eat. Stevens captures that reaction where Leslie/Liz recoils from a dish she's offered. Bick has just informed her that it is a "calf's head," not realizing this is the wrong-est thing to say. We know from incidents of the barbecue that Bick/Leslie are in numerous ways mismatched. Stevens makes sure ranch hands unwrap the calf head so we won't miss detail. I envision the director preparing final form of Giant, perusing dozens of calf close-ups to pick a most graphic one. Such detail is what makes Giant a favorite, certainly for me. Stevens cuts from the close-up to meat dropped heavy on Leslie's plate, us knowing what result will be. She'll faint, as expected and set up from previous shots, the sequence ending with Luz saying to herself if not other characters that "I knew this was going to happen." For himself, Stevens could build to multiple pay-offs here and in other highlights of Giant, structural echoes from silent comedy he worked on years before at Roach. 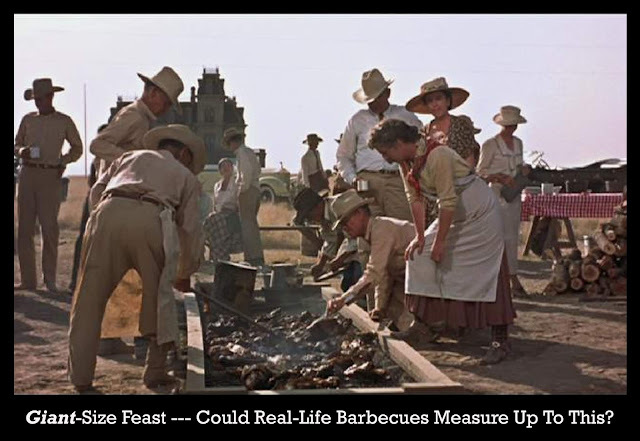 You could take out the barbecue and call that splendidly realized portion a whole movie, notwithstanding so many other wonders to enjoy in Giant. GIANT...We live in a world where people think seeing a motion picture on a computer screen or on the screen of their phone is experiencing it. Everything is getting smaller by the minute. True enough, Reg. As you say, GIANT is likeliest seen nowadays, if at all, on a desktop monitor or palm-size device. What do you suppose George Stevens would say to that? I hate GIANT. It is a complete display of mediocrity and totally unworthy of any praise. I have been seeing this film for more than 30 years and I always find self-indulgence in a completely stupid story filled with idiots. You can put GIANT either on a phone, and old TV, or an Imax screen... it is nothing more than a display of mediocrity by a director whose most acclaimed post war films have aged badly. George Stevens was probably far better as a cinematographer. For barbecues I prefer the ones from Argentina, which are really great. Ouch!! Well, at least you enjoy Argentinian barbecue. radiotelefonia, who ruined your day? George Stevens knew how to make movies people actually wanted to see. There are a whole lot of folks these days who can't do that. Seems to be a lost art. GIANT's fine. It was fine then. It's fine now. I have never had any myself, but I understand that they are quite tasty and have some salutary health benefits as well. 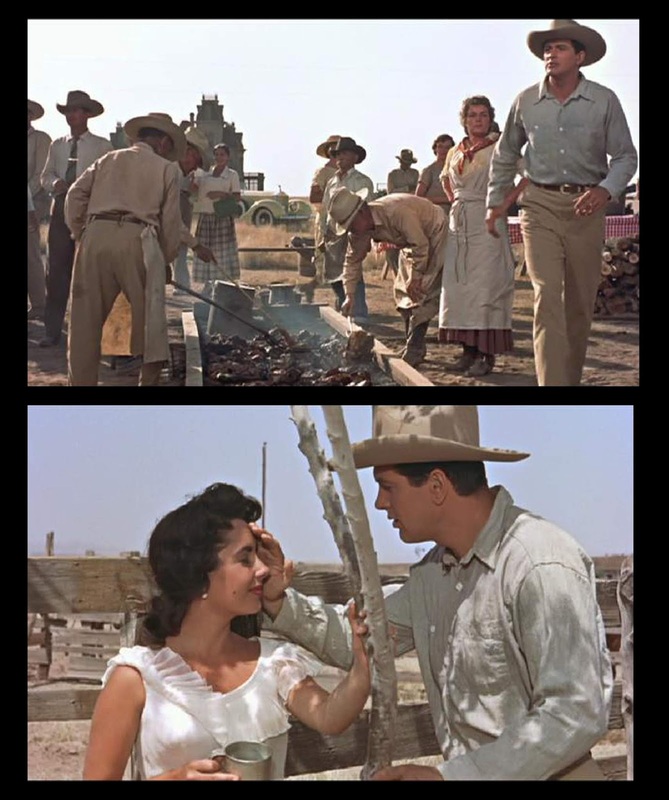 George Stevens may had a skill to make people of his generation that wanted to see. GIANT is still a mediocre film from begin to end and it does not deserve any kind of praise. Stevens directorial style is the coldest and uninspired that I have seen in screens. 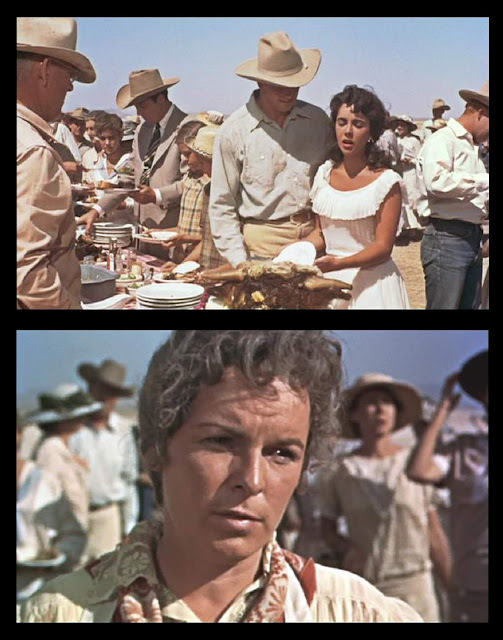 Except for Mercedes McCambridge performance, GIANT is an extremely boring soap opera, completely forgettable during the second half. James Dean celebrity status is an exaggeration... SAL MINEO's fully character overshadows him in REBEL WITHOUT A CAUSE. Interesting what registers with people and what doesn't. I've seen GIANT at least twice, maybe three times, and had I been at your reunion, I would not have been reminded of the movie. I didn't even remember there being a bbq in the movie. 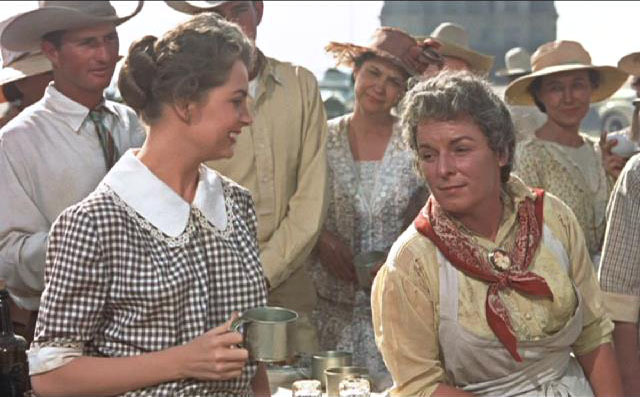 I do remember other parts, principally Dean, but also Rock Hudson and Mercedes McCambridge and ... Chill Wills. I have to admit that, gorgeous as she was, I have almost no mental image of Liz from this movie. Odd. As for Dean, I think he's genuinely great in REBEL WITHOUT A CAUSE, almost great in EAST OF EDEN, and just too much in GIANT. It's certainly an interesting and arresting performance, but not a good advertisement for James Dean as Great Actorrrrrrr. Something I wonder when I see those images of the house in the middle of nowhere. Did they find a massive piece of nothing and manage to keep it completely clear of vehicles, crew and onlookers for those shots (granted, they could hide some stuff inside or behind the house), or was there some matte work to erase intrusions? Other images remembered: The house later acquired a silly front lawn and finally a suburban-style yard with swimming pool. Satiric visual comment, I guess, but it also turned the initial gothic weirdness of a lonely Victorian manse into something close to scifi. We must bear in mind that our reactions are 100% subjective. What may not move me may move you. When I saw Speilberg's PRIVATE RYAN I was with my friend Doug Eliuk who was one of the head honchos of the National Film Board of Canada. Both of were staggered by how bad it was. That view was and is not shared by the millions who like it. Ditto my friend Bernard Hashmall with whom I saw SCHINDLER'S LIST. Bernie described it as, "E.T. of the Holocaust" which it is. I had an absolute antipathy to W. C. Fields until I began to program his films at Rochdale College. They provided the financial backbone for my program. I ran them week after week after week to capacity crowds laughing their heads off. Seeing him in that setting and watch his work work I grew to love him. I also learned a lot from him. Sal Mineo turns in a terrific performance in REBEL WITHOUT A CAUSE, yes. 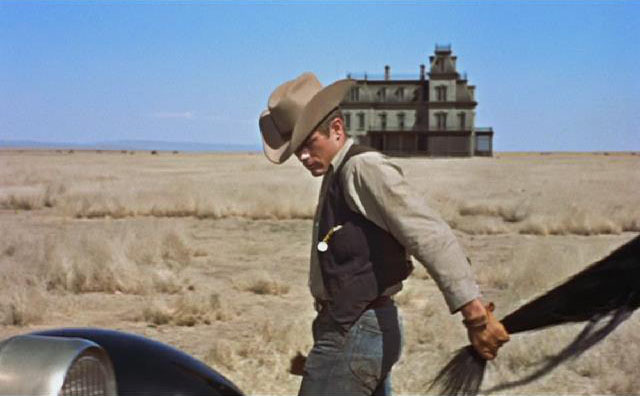 That movie, however, belongs to James Dean as does EAST OF EDEN. GIANT is epic in every sense of the word. Turning Edna Ferber's massive novel into a movie took doing (as, before it, did Margaret Mitchell's GONE WITH THE WIND). At heart both stories can be called soap operas (as can Homer's THE ODYSSEY and many great epics poems from antiquity) but so what? That does not invalidate them. I have nothing to complain about soap operas. I used to see TV shows which were of this genre. Yes, they were cliched, static in terrible sets, there was no actual action, just people having lots of dialogs. But they had terrific actors who were extremely engaging and great professionals that were so good that managed to keep these shows afloat. Today, soap operas are more dynamic and visually more believable, but today's actors are not nearly as good. The few movies based on Edna Ferber's novels that I have seen, more than once, never impressed me at all. GONE WITH THE WIND never impressed me, though. I only occasionally go to the movies these days, and when I have to go to the restroom I go and I don't feel that I missed much. I did like SCHINDLER'S LIST and I did not like SAVING PRIVATE RYAN. I have seen several movie classics on a big screen with an audience yet I don't remember instances in which that experience was different than watching movies on television alone. I wish I could have a cinematheque close to my home. I could watch the Fernando Martín Peña show online for free and legally, as I have been doing for more than 10 years here in Massachusetts, accessing obscurities. Where else I could have been able to see movies like these ones? 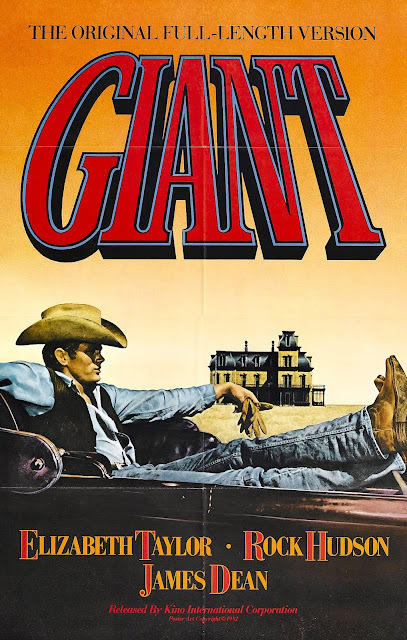 I've seen "Giant" several times over the years, since first catching it over a couple of nights on tv in the 1970s. The more I see it, the more I'm not impressed by James Dean and the more compelling I find Taylor and Hudson. Dean just comes off like a show-off actor, throwing anything at the wall to see what sticks, while Taylor and Hudson offer very polished and thoughtful performances. I think "East of Eden" was likely the best use of Dean's talents. Kazan was able to reign in some of Dean's ego and find the unconventional parts of his acting style that really worked with the story. I saw Richard Lester's THE THREE MUSKETEERS in a 5,000 seat theater. Right from the get go the movie had the audience firmly in its grip. We were wowed. The expressions of awe, delight, laughter at the gags, the thrills of the chase, everything was amplified by the fact all 5,000 of us were having one helluva grand time. I saw WITCHFINDER GENERAL (then titled THE CONQUEROR WORM) on a midnite bill in a 1,000 seat venue. When the film ended the gasp of horror from the audience uttered as one breath was incredible. People ran for the exits they were so shocked. The film later played on an all night bill in a 5,000 seat house. I took a friend. I told him that when the film ended all 5,000 people sitting there with us would shout out in horror and flea for the exits. they did. I went to the first showing of NIGHT OF THE LIVING DEAD, THE TEXAS CHAINSAW MASSACRE and other titles in huge theaters and watched them do their stuff. The movie going experience is a communal one dating back to fires in caves when we told stories to help get through the night. Admittedly, there will always be those who are unable to share that excitement. Though their voices are loud, their numbers are few. I remember when my brother and I watched the first STAR WARS film. God, it started great and kept getting better. We, the audience, were in Heaven. Then there was THE VILLAGE OF THE DAMNED which I saw in first release as a kid in New Brunswick. By the film's end people in the audience were reacting emotionally with a hatred I had never seen before. When I first screened Leni Riefenstahl's TRIUMPH OF THE WILL I watched as non-German people reacted mostly bored as it is speeches and parades. But the German people! They said, "Even knowing what he did this film is almost impossible to resist." The audience is the teacher. @Reg, I've just seen Bohemian Rhapsody on the big screen (the Scotiabank Theater here in Toronto) last week, and I plan to see the new Wreck-It Ralph movie two weeks from now-what I mean to say is, I still love to go to the movies a lot. So do a lot of younger people, as can be seen by box office receipts for many big-budget sci-fi films-don't count them out just yet. As for Giant, it's alright, but not as amazing as Lawrence Of Arabia or The Guns Of Navarone, or even 2001: A Space Odyssey, which I saw here in IMAX at Cinesphere this August. And you're right, the audience is the teacher. Terry Ramsaye wrote in 1925 that the audience for the movies is between 11 and 30, primarily 14 to 24. Those figures still stand. After 24 and certainly by 30 most of us stop ging to the movies. In 1925, however, that audience was mostly female. In the 1970s film producers began making movies for 13 year old boys. Once they did that they lost the women and most of the men. They lost the women because they are not interested in the things 13 year old boys are interested in. They lost the men because men are more interested in women than in movies. Men go where the women are. That's a no brainer that it seems the industry does not have the brains to understand. I like Dean's use of props in this movie. 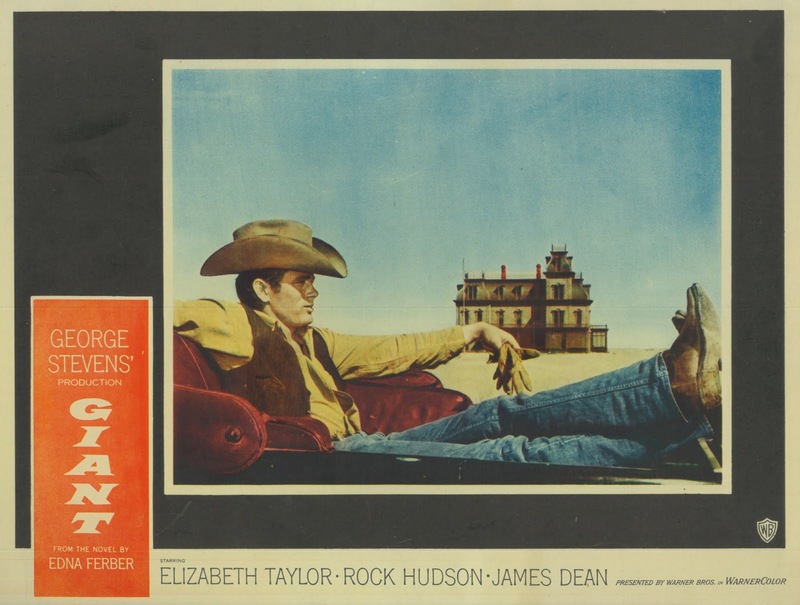 Come to think of it, Dean's character in the film serves as a sort of prop in (and for) the story of the Taylor-Hudson family - somehow extraneous, yet integral too. GUNS OF NAVARONE I don't know (I've seen it) however with LAWRENCE OF ARABIA and 2001 A SPACE ODYSSEY we're talking about the very top level of film making. those pictures are in a class that includes very few motion pictures. One of those few is THE BIRTH OF A NATION (1915). Again. it's easy to be detached from THE BIRTH in a living room or classroom setting. When I scored it I scored it completely differently from how everyone else approaches it. My goal was to have the audience on its feet roaring its applause when the film ended. They did and do. Now we're talking about the power of the movies as a mass medium. It's turgid and dull and badly acted - especially the second half. Stevens was always a middlebrow. Dean did well to exit young, based on his mannered overacting here....... Taylor and Hudson survived, and look at what happened to them. Cast opposite the plastic Movie Star Glamour of the leads, MaCambridge seems almost real and is watchable in her reliably odd style, but she was never interesting enough to carry a whole movie. One communal cinematic experience I'll never forget was with the 1980s re-release of Hitchcock's "Rope". 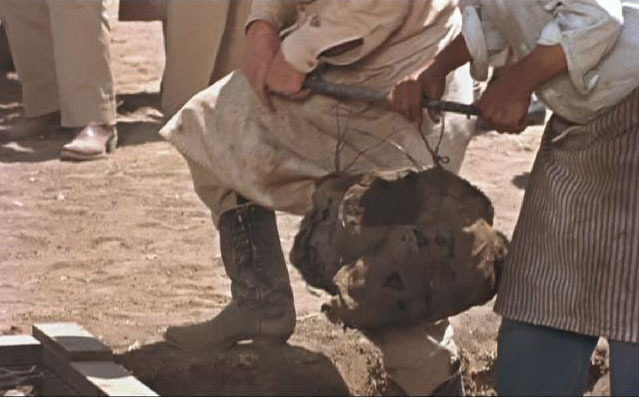 Specifically, the scene with the maid cleaning off the top of the trunk where only we can see a piece of the rope hanging out. You could hear and feel the audience getting more nervous as the seconds passed, with one woman actually letting out a little scream. Oh, and the 1987 thriller "The Stepfather". By the end, the woman sitting a few seats away from me appeared to be shellshocked. Never heard of THE STEPFATHER (1987). Now I have to see it and the 2009 remake. 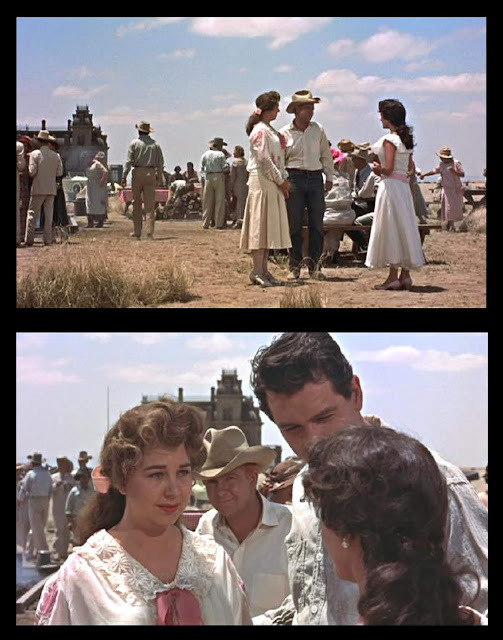 I love 1950’s movies and “Giant” is one of the big ones of the era, but I think Stevens hits the viewer over the head with the important themes, instead of trusting the audience’s intelligence. Dean takes the biggest risks as an actor and adds much to the proceedings, and while most of the rest give safer, more traditional performances, what a cast!